Trinidad and Tobago Government to run .tt? 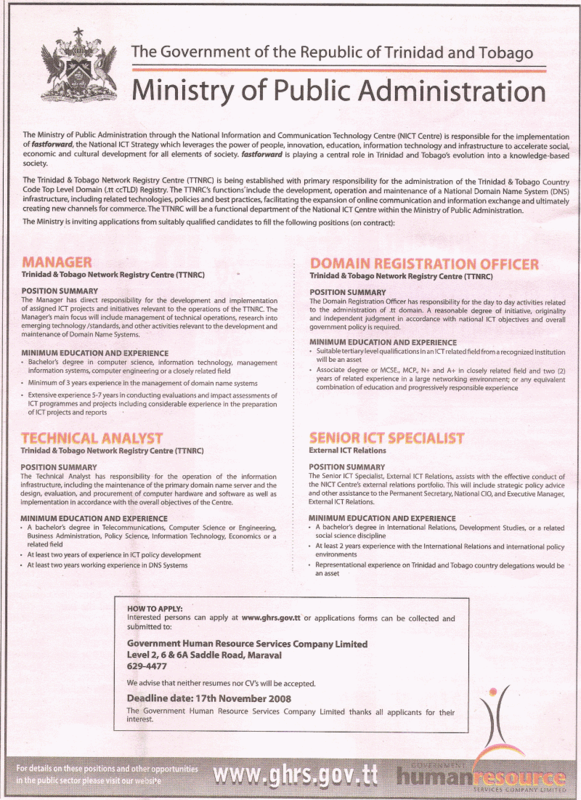 The Ministry of Public Administration (MPA) has advertised in the daily newspapers for positions in the Trinidad and Tobago Network Registry Centre (TTNRC). “The Trinidad & Tobago Network Registry Centre (TTNRC) is being established with primary responsibility for the administration of the Trinidad & Tobago Country Code Top Level Domain (.tt CCTLD) Registry. The TTNRC’s funclions include the development, operation and maintenance of a National Domain Name System (DNS) infrastructure, including related technologies, policies and best practices, facilitating the expansion of online communication and information exchange and ultimately creating new channels for commerce. The TTNRC will be a functional department of the National ICT Centre within the Ministry of Public Administration. The deadline date for applications is given as November 17th, 2008. The implication from the notice implies that the Government of Trinidad and Tobago via TTNRC will (or wants to) administer and run the .tt ccTLD currently run by the Trinidad and Tobago Network Information Centre (TTNIC). Posted on November 3, 2008 Author Dev Anand TeelucksinghCategories icannTags .tt, ccTLD, domain, icann, lacralo, telecom, trinidad, tobago2 Comments on Trinidad and Tobago Government to run .tt? Matthew Mullenweg, the founding developer of WordPress.org and the founder of wordpress.com registered ma.tt and blogs about the discovery of .tt and registering ma.tt with TTNIC. He highlights the problems with getting a .tt domain (unable to use credit cards to pay for .tt domains online, waited one week for confirmation that his payment was accepted) but is happy with his new .tt domain. Perhaps this will get more interest in .tt and hopefully more interest by local users to care about .tt TLDs. I’ve noticed that there is a sco.tt domain registered.